I’m a stay-at-home mom with a 19-month-old baby boy. 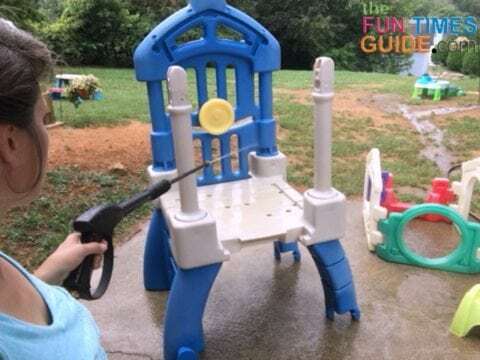 I’m always looking for ways to keep my son entertained while enjoying our backyard — to get some fresh air whenever the weather permits. A while back on Facebook Marketplace, someone was giving away an old, sun faded, clearly “seen better days” Little Tikes outdoor climber with 2 slides. I know how expensive these things can be when purchased new, so I was willing to tackle a DIY project at the price of “FREE… with a little elbow grease”. I messaged the owner, completely prepared to be informed that someone was already on their way to get it. But lo and behold, she responded with: “How soon can you pick it up?” I was at her house the next day loading our newly acquired toddler outdoor climber in the back of our 4×8 utility trailer. I knew that my husband wouldn’t be happy to see this heaping pile of sun-faded plastic in the yard — so it was a good thing he was out of town when I went to get it. I had a couple of days to polish it up, and hoped that some fresh paint would hide all of its sun-faded imperfections. 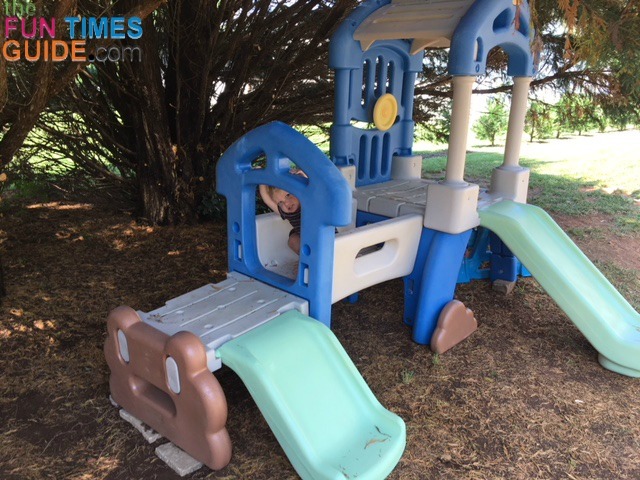 I just knew this Little Tikes outdoor climber would provide some entertainment for my son who absolutely loves to climb. Plus, I figured it would also provide some fun for all of the neighborhood kiddos who come over to play in our backyard. My husband was only gone for a couple of days, so I had to act fast to get this giant kids outdoor play set up to an aesthetically pleasant and neutral look. #1 – First, I disassembled all of the pieces — so I could pressure wash everything. Only then would I be able to truly assess the sun damage and wear & tear on this Little Tikes outdoor climber. #2 – Next, I cleaned every piece of the toddler outdoor climber using a pressure washer. The blue and sand-colored pieces were in decent condition and were subtle enough in color to not be distracting in the yard, as is. I decided the remaining pieces such as the roof and the bridge were a badly faded yellow that would need to be repainted to match the existing sand color (which matched almond color paint). I would also change the 2 forest green pieces to a dark brown color and the 2 badly faded red slides to a fun pistachio green color. I bought 2 cans of each of the 3 colors in a satin finish of Krylon spray paint for plastic. #4 – Once the pieces were dry from the cleaning, I scrubbed them with a brush to knock off any pressure washing debris. I sprayed lightly and evenly — to avoid any drips. While I was painting the toddler outdoor climber, I still had no idea where I would be setting it up. I knew my husband wouldn’t want it in the grass — because he would have to mow around it. So it had to be somewhere inconspicuous… and level! Our backyard is a continuous sloping gradation downhill, so I had to consider the placement carefully. We have a row of giant cypress trees in our yard, which provide amazing shade in the afternoons. I had already trimmed back several of the bottom branches in order to utilize the shaded space underneath the trees. There’s always a nice breeze through there, and the temperature remains very comfortable despite how hot it is outside. So I decided to set up the Little Tikes outdoor climber under those cypress trees — so we could play outside anytime. The cypresses do produce sap, which is quite sticky, so I ended up adding a sun shade sail directly above the climber (attached to the cypress branches) to catch the bulk of the pine needles and prevent sap from getting on the climber play area. 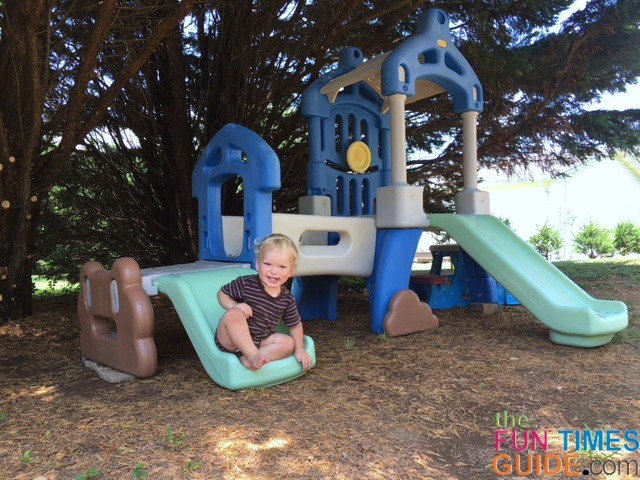 We have used the toddler outdoor climber for a couple of months now. It has been a great addition to our little shaded oasis in the backyard! We love to be outside, but sometimes in East Tennessee it can be brutally hot in the direct sun — so it’s nice to have a place to play outside anytime. In the end, this toddler outdoor climber makeover cost me a little time, effort, and 6 cans of spray paint. But it has made my son’s face light up when he plays on it more times than I can count… which is priceless to me.